The tyrannical, dysfunctional, corrupt, selfish, incompetent, impotent, wasteful, insolvent municipalities in St. Louis County have to go. Save an appearance of leadership and courage at the state or regional level, it is unlikely an intervention from the Governor and Legislature or a Board of Freeholders (tough to convene, let alone passing something they have proposed) will happen. Residents desirous of change in their towns will have to take it upon themselves to dissolve them. Sen. Eric Schmitt’s bill to limit the portion of a municipality’s budget that comes form traffic fines and fees to 10% has a good chance of passing this session. Without increasing revenues from traffic fines and fees many towns probably wouldn’t have made it through the recession. The legislation may starve some town governments, but it will still take action on the part of citizens to put them out of existence. Getting rid of one is rare. The most politically savvy and organized are usually the ones invested in perpetuating the status quo. An attempt in Uplands Park in 2013 failed. The only one to dissolve this century is St. George, which voted to disincorporate in 2011. It took just 345 votes to make this happen. Two articles in the Post Dispatch a year after the dissolution show that it turned out to be no big loss for residents, and other than concern over the removal of some stop signs, some are quite happy with the changes that came in becoming a part of unincorporated St. Louis County. The italicized quotes below come from them. The maintenance deferred in St. George ultimately became the burden of the entire county. Town officials all over the county defer maintenance in favor of maintaining staffing and service levels. They hold on to low productivity land uses while depending on county, state, and federal subsidies for infrastructure funding. The bill is only getting bigger the longer they endure. Ultimately, financial necessity sparked the decision to be absorbed into unincorporated St. Louis County. By disincorporating, residents avoided tax increases to repair aging streets. If the 24 municipalities in the Normandy School District consolidated, it would have more than 44,000 people, the third largest in St. Louis County, and be in a much stronger position to confront the challenges there without risking being ignored as part of unincorporated St. Louis County. Instead of wasting money on 24 of everything or wasting time and energy each time to come up with a cooperation scheme on this or that, one city could hire professionals to help with economic development, planning, writing grants, lobbying the county and state, be able to issue debt, etc. But consolidation would require many to give up the status quo. I’m pushing for disincorpoations over mergers because while difficult, mergers are even more difficult. More than one entity has to form a plan, one entrenched interest has to give up something to another, and it would have to pass in each jurisdiction at the same time. A disincorporation involves only one jurisdiction. Afterwards the unincorporated area could be annexed into another town which brings then into another system rather than merging two existing ones. She especially appreciates the police services versus those under St. George’s department. The relevant statute for villages is 80.570. A petition with signatures of half the voters is required. A tall order. The Board of Freeholders petition only requires 3% of voters in St. Louis City and St. Louis County. The legislature should lower this requirement. A 60% majority is needed to pass. Sen. Jamilah Nasheed has prefiled a bill that would disincorporate all the villages in St. Louis County. There are 20 with about 19,000 residents in total. I doubt this will go anywhere. Calverton Park voted to change from a village to a 4th class city last November. Anticipating scrutiny over its heavy reliance on court fines and fees, they proposed the change so they would have more options to raise taxes. Fragmentation is expensive after all. “If the voters had said ‘no’ against the disincorporation, we would have had to raise taxes,” Wilkerson said. The relevant statute for 4th class cities is 79.490. The process is pretty much the same with the same high bar of petition signatures. The legislature should lower it. 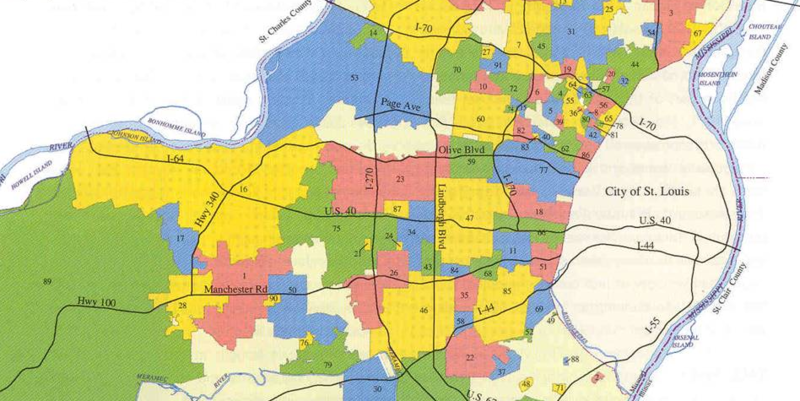 There are 44 in St. Louis County with a total of 213,000 residents. There is no process for the disincorporation of 3rd class cities. The legislature should add one. There are eight in St. Louis County with a total of 125,000 residents. Home rule cities may put a disincorporation process in their charter. There are 18 in St. Louis County with a total of 327,000 residents. Unincorporated St. Louis County makes up the balance of the county with 323,000 residents – in effect the largest municipality in the St. Louis region. Rep. John Diehl, now Speaker Diehl, proposed HB 1891, a municipal accountability scheme, in 2012. This should be revived, worked on, and passed. It would set standards of performance for municipalities with a “shape up or ship out” mechanism that could result in dissolution. If we want things to change, we actually have to change things. These towns are a cancer on the region and are a disservice to those living in them. This is something I’m proud we did. Update 2/17/2015 – Representative Bob Burns introduced HB 741 which makes it easier to disincorporate municipalities in St. Louis County. The number of signatures required to put it on the ballot would be reduced to 25% of registered voters. Passage requires a simple majority. It adds the same disincorporation procedure for 3rd class cities.